Welcome to another JAX Starz Blog Hop! This month our challenge is to make something for the theme of fall! Since I had my first Pumpkin Spice Latte yesterday... I'm definitely looking forward to the cooler months ahead and glad that fall is just around the corner! You may just be starting the blog hop or may have come from Susan Best's blog. You can follow the full blog hop lineup below to move along from blog to blog, so you can see all of the new projects. First I have to say that the colors look perfect on my camera in these pictures, but kinda dark on my screen so hopefully they come across to you okay today! :) I made a quick card to share today using scraps from my scrap pile... so much fun and I used up some extra paper! 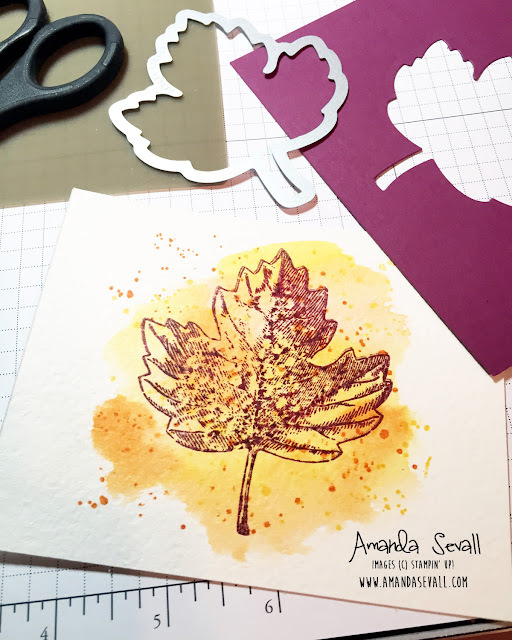 Lots of bright fall colors and fun new stamps in use here... this particular card was made using our Vintage Leaves and Sheltering Tree stamp sets and the Leaflets framelits. I used the watercolor brush from Sheltering Tree first to create a background and then stamped the sentiment on top of that using Versamark ink with White Embossing Powder. Here is a little peek at what the piece of water color paper looked like before I assembled my card! To make it, I quickly washed the background of what would peek through my die cut leaf with some Daffodil Delight ink and Pumpkin Pie ink using my Aqua Painter. Then to finish it off I used my Gorgeous Grunge stamps to add some "perfect" messy ink splats using the same two ink colors and stamped my leaf image using Rich Razzleberry over the top of all of it. Bold Colors. Have fun with the colors you choose for your projects! I usually choose mine my pulling my ink pads or cardstock and seeing what looks good together. For this particular card I had a scrap of Rich Razzleberry cardstock just sitting on my desk and it ended up being the launching pad for this card. Once I had this purple picked, I just grabbed some fall colors of yellow and orange that looked good with it and got to work! Negative Space. Most of the time when using die cuts I use them to cut out something I stamped and today I did the opposite. I die cut out my leaf first to create a window to see the stamping I did behind it. It's a really simple way to add some extra wow to your card! Gorgeous Grunge. I would be remiss if I didn't point out the use of my favorite stamp set that really just adds some extra dimension to my cards! The Gorgeous Grunge stamp set is the perfect way to finish off a water colored background. It's the fun spattered background that is simple and not at all messy to use... and the best part is that it looks perfect every single time. I highly recommend adding this stamp to your stash... it is definitely one of my favorites! Such a pretty card! Love the colors! And love how you used the grunge for the background! I never would have thought of that! Wow! What a great fall card Amanda! I love the little peekaboo with the leaf going on! Very pretty card. Love the color combo! I love your negative use of the framelits Amanda! And, I love the simple white background too (from before you assembled the card)-your watercoloring is so pretty! I may have to case that if you don't mind. Love the colors and the technique used to make the card .